I once worked as a runner on a construction site and lost my job when the head carpenter, a fully grown man with a Sir Lancelot haircut, discovered I was a homosexual. We'd gotten along fine all summer, but the moment I questioned his thirst for beating up transsexual prostitutes, he came at me with a hammer. The foreman had let me go as gently as possible, explaining that if he ever hired an all-girl crew, I'd be the first person he called. For a long time afterward I thought of this head carpenter, always placing him in a position of grave, physical danger. The walls of his cell were closing in. A train was headed for his bound-and-gagged body. A bomb was set to go off and only one person could save him. "But first you have to take it all back," I imagined myself saying "And this time you have to say it like you really, really mean it." I fantasized about it for a few months and then moved on to something else. My hands tend to be full enough dealing with people who hate me for who I am. Concentrate too hard on the millions who hate you for what you are and you're likely to turn into one of those unkempt, sloppy dressers who sag beneath the weight of the two hundred political buttons they wear pinned to their coats and knapsacks. I haven't got the slightest idea how to change people, but still I keep a long list of prospective candidates just in case I should ever figure it out. 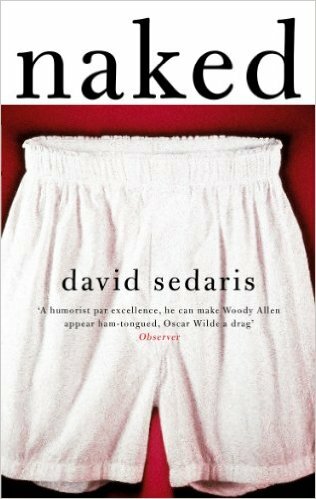 In Naked, Sedaris turns the mania for memoir on its proverbial ear, mining the exceedingly rich terrain of his life, his family, and his unique worldview--a sensibility at once take-no-prisoners sharp and deeply charitable.